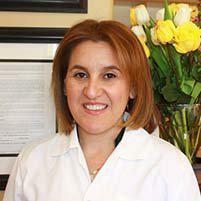 Sharareh Khoshbin, DDS is a general dentist practicing at Torrance Dental Care in Torrance, California. Dr. Khoshbin provides the highest quality dental services, including fillings, pediatric dentistry, cosmetic dentistry, and periodontal therapies. She applies the latest technology to her dental work, including digital X-ray imaging. She's also certified in applying Invisalign. Dr. Khoshbin and the team at Torrance Dental Center follow strict protocols for infection control and sterilization. A UCLA graduate, Dr. Khoshbin majored in biology. She received her degree in dentistry from the University of Southern California in Los Angeles in 1998. Following her graduation, she became a clinical professor and periodontal instructor with USC periodontics department until 2002. Dr. Khoshbin is very attentive to her patient’s needs and takes pride in exceeding their expectations in both general and cosmetic dentistry. In her free time, she loves to read, study US history, and paint. She speaks fluent English and Farsi.